What Tailored loD (K) training is all about? loD (K) can arrange in-house seminars which can follow either of our standard seminar programmes or which can be tailored your company's needs. The seminars generally take place over 2 days. Timing and content can be flexible to suit your organization's individual needs. We can work with your own contracts - your particular conditions and your problems. You can be frank and open, minimizing problems of confidentiality. The whole course can be tailored towards specific areas and focus on topics relevant to your organization. Participants gain a common understanding of the course. Create a team vision and "buy in" at all levels of the organization. Allows choice of seminar dates and length, minimizing disruption to the company. 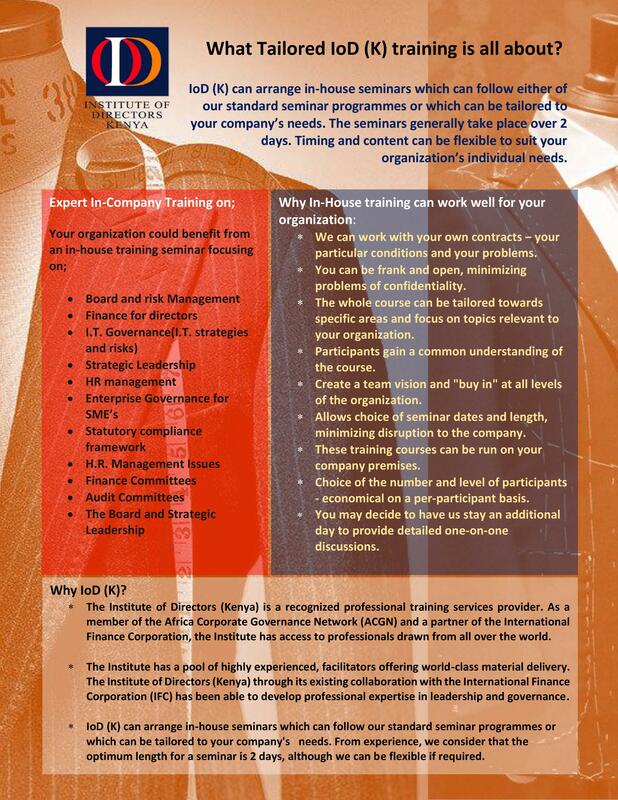 These training courses can be run on your company premises. Choice of the number and level of participants - economical on a per-participant basis. You may decide to have us stay an additional day to provide detailed one-on-one discussions. The Institute of Directors (Kenya) is a recognized professional training services provider. As a member of the Africa Corporate Governance Network (ACGN) and a partner of the International Finance Corporation, the Institute has access to professionals drawn from all over the world. The Institute has a pool of highly experienced, facilitators offering world-class material delivery. The Institute of Directors (Kenya) through its existing collaboration with the International Finance Corporation (IFC) has been able to develop professional expertise in leadership and governance. loD (K) can arrange in-house seminars which can follow our standard seminar programmes or which can be tailored to your company's needs. From experience, we consider that the optimum length for a seminar is 2 days, although we can be flexible if required.